We frequently have emails from impatient users who haven't received their delivery by the expected date. "As of this date, 1/23/13, the below referenced shipment has not been received. It was ordered on 1/8/13 and shipped on 1/9/13. 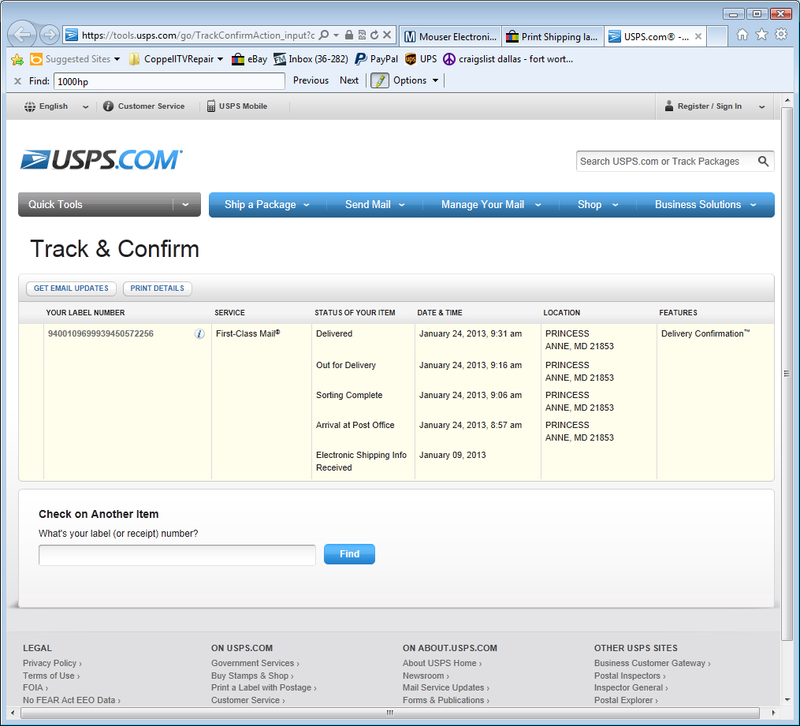 The USPS site has not updated shipping since 1/9/13 and today is two weeks. Can I please get a replacement shipping? If I should receive the initital package, I will advise and promplty return. Thank you." This is actually quite polite as far as request goes. We may add a few more here when they arrive today or tomorrow. When we receive a request like that we usually check the online tracking information and find out that the package is still "in progress", so we get back to the aggrivated aggravated buyer and make them even more aggravated by telling them that we've shipped on time (as can be seen) and that delivery is out of our hands. To which they usually respond that this is not their problem, that they have customers (or TVs) waiting and that should we only ship another package they'll promptly return the duplicate when it arrives. Most commonly the package just "disappears" somewhere during transit and goes MIA for days before it shows up. Sometimes the tracking information doesn't even show the package as picked up by the carrier, often until the day it arrives at destination at which point it shows all in one day and one place. This is fairly common for USPS, but we haven't seen it with UPS so when a customer cried wolf around Christmas and UPS did not indeed show the package as picked up we first called them and then, because custome kept crying we sent another package. But how could you leave someone without a TV at Christmas and New Year , especially when carrier information shows package was never picked up. Must be still somewhere in your warehouse , right? Package showed up two weeks later, just as the second one we sent (which also was not "picked up" until after Christmas - apparently a UPS mishap around holidays). Think the customer returned the extra power board? When I have enough time I'll find the tracking numbers and the communication with that customer and post them as well. For now, though, if you read those you should know why we wouldn't rush a second package when the first one is delayed somewhere in transit. I have a Magnavox 42MF231D/17 found in trash. blue light turns on on front of TV, relays click, no picture. It sounds like there is a power line-like buzz coming from the Y-SUS board. I haven't really been able to find any tips on diagnostics. This is my first Plasma TV repair. I have found the model of the Y-Sus board and Buffers on ebay for about $200. That sounds like a fair bit of money for something i found on the side of the road! I am interested in fixing the TV. The Magnavox 42MF231D/17 plasma TV uses the infamous trio LJ92-01200A and the accompanying two buffer boards that are subject to past articles in this forum and (subsequently) many other places around the web. The trio is the most likely culprit in the TV, but I would start with focusing your attention to the fact that while easily the most likely candidate you should not automatically take it for granted that this is the problem in your particular case. it may as well be power board or main board, may be the ZSUS or practically anything else, not that much else is left. But since the Y-Main and the buffers are far above any other board in the suspect list it is practically justified looking there first once you know it's not an essential failure in the power board, i.e. the TV is not completely dead, for example. I would also point your attention to the following: eBay and the Net in general is by now full with bad replacement sets, usually from China, but also local. ShopJimmy also offers used sets when they have them and in my opinion this is just as bad as the Chinese sets only it can get to you faster. By "bad replacement sets" I mean sets that are made up of one original or repaired Y-Main board and two original (or, less often, repaired) buffer boards of the original release with 6 ICs. Those are time bombs waiting to explode on you and it won't be long before they do. First, make sure you get both the Y-Main LJ92-01200A and the two buffer boards from the same source; this will make it easier for you to handle any issues with them whereas if you get sustain board (repaired or replaced) at one source and the buffers from another, should a problem occur they'll both blame each other and you'll be in the middle cursing everyone including yourself. Second, always go for new buffers with 4 ICs hopefully from a reliable source; it's been enough time since they were produced at the end of 2010 and by 2013 there are still brand new ones available through reliable Samsung vendors, but they cost a bit more (Samsung keeps prices high and only works with limited set of distributors resulting in longer and more expensive distribution chain) and there are most likely already used buffers with 4 ICs which may also have limited life left in them. Third, you don't always need to service the Y-Main board when a buffer fails. Read the above articles and if you have an image with horizontal lines only then your Y-Main is still good and you only need buffer boards. And even if the display is all dark you may still have a good Y-Main and bad buffers, only this is less likely. Send all three to a reputable repair company (like us) and if you don't need to repair the Y-Main it'll be a bit cheaper. Point here is to send boards for evaluation and repair rather than buying a full set outright since in this case you pay as if your Y-Main is bad (which it indeed will be most of the time) while if you can stay a few more days without that TV it is worth sending the boards for evaluation and possibly paying less. Four and last, we do both repairs and exchanges of complete sets, we are smart, reliable, professional, intelligent, honest and , above all, modest. So no reason to go anywhere else, right? Send your trio for repair or buy a a replacement set outright. Or we will tell the teacher!